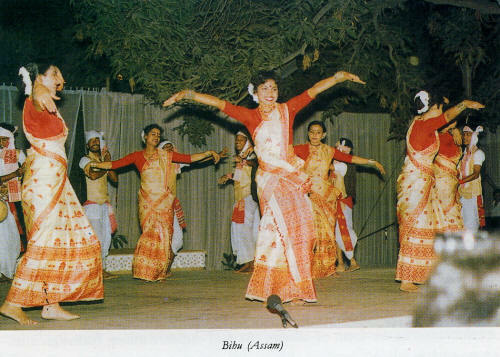 One of the most representative harvest dances is Bihu of Assam which is mainly observed in rice growing areas. On three most important stages of agricultural operations Bihu festival (utsava) is held just before the sowing of the seeds, at the time of transplanting the paddy seedlings and while harvesting. The word Bihu is a derivative of the Sanskrit word Visuva that means equinox. The Assamese pronounce ‘S’ as ‘H’, therefore, they pronounce Visuva as Bihuba. In Assam, Bengal, and Orissa, ‘V is pronounced as ‘B’. The shorter form of Bihuba is Bihu. Of the three Bihu festivals, the most colorful and lively is the Bahag Bihu which is held from the first day of the lunar month of Vaishakh, the Assamese derivative of which is Bahag. This is the day of the vernal equinox and the Indian New Year’s Day. In fact, the festival begins from the New Year Eve and continues from four days to one month. The Bahag Bihu is celebrated in four stages of development. The first is known as Goru (cattle) Bihu. It may last for one or more days. In Goru Bihu the cattle, especially the cows, are specially treated with oil-bath and food like salted rice cakes. In the evening there is music and dance. The next is Manuh (human beings) Bihu in which after a ceremonial bath people wear new clothes. Boys and girls perform Bihu dance to the accompaniment of Bihu songs which are basically love songs. The songs are quite tuneful. The musical accompaniment is provided by Dhol, the drum, Pepa, a buffalo-horn pipe, Toka, the bamboo clapper and cymbals. The next is Gosain Bihu in which people gather in the shrine called Namghar. There, all pray to God first and then the musicians’ and dancers perform. The Bihu festival is concluded with Bihu Urva which means sending away the Bihu. This is done at a lonely paddy field or forest where the villagers go with all the ritual materials used during the three phases. A ritual is performed to bid farewell to Bihu. The Kankali Bihu is held in the lunar month of Kartik corresponding to September/October. This month in colloquial Assamese is called Kati. Therefore, the festival is also called Kati Bihu, At this time of the year paddy seedlings are transplanted. The festival is held for proper growth of the transplanted seedlings. It is observed with solemnity. Rituals are performed and prayers are sung. Usually dance is not performed during this Bihu. The Bhogali Bihu, also called Magh Bihu since it is held in the lunar month of Magha, corrresponding to December/January, is again a festival of gaiety and jubilation. By the time the festival is held, the harvesting is almost over or at the last phase. Houses are full of harvested grains. This is the time for the villagers to celebrate. Therefore, the dances performed during the Bhogali Bihu are more vigorous and faster in tempo than the dances performed during the Bahag Bihu.